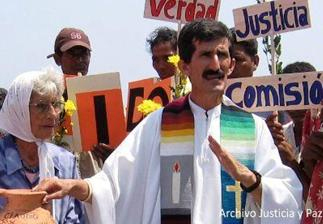 The Inter-Church Commission of Justice and Peace (La Comisión Intereclesial de Justicia y Paz, CIJP) first received protection measures from the government in 2008. They are subject to near constant threats, attacks, and intimidation for their work in defense of human rights in Colombia. Father Alberto Franco, founding member of CIJP, was waiting for his government-provided armored car to take him to work on the morning of February 13. Given a string of recent incidents, the driver of the car scouted out the area surrounding the Fathers home. 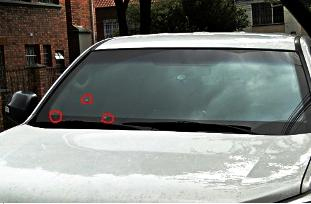 While the driver was outside of the car, someone shot three bullets into the passenger side of the windshield of the car. Fortunately, no one was in the car and no one was hurt (see photos below). This clear act of intimidation comes at a critical time. Last week, seven Members of the U.S. Congress sent a letter to President Santos of concern regarding threats and attacks against CIJP and the communities that they accompany (i.e. Curvaradó and Jiguamiandó). CIJP is also leading a case at the Inter-American Human Rights Court (IACHR) regarding state culpability in the murder and displacement of innocent Colombians in northwestern Colombia in 1996 and 1997. CIJP has documented and denounced the threats and attacks against them, yet investigations have not resulted in justice for the perpetrators and intellectual authors of these actions. Given the dire stakes regarding their safety and the extensive documentation in the cases, government leaders must take public action to ensure the security of members of CIJP and the communities that they accompanybodyguards, armored cars, cell phones, and bulletproof vests are not enough.